Earlier this month, Qualcomm was able to convince a court in China that Apple had infringed on a couple of its patents. That led the court to order a preliminary importation and sales ban in China for the Apple iPhone 6s, iPhone 6s Plus, Apple iPhone 7, Apple iPhone 7 Plus, iPhone 8, iPhone 8 Plus and iPhone X. The ban was issued on models running older versions of iOS, and Apple had thought that by updating the affected models with the latest version of iOS 12 (which was believed not to include Qualcomm's patented software), the status quo in China could be maintained. But apparently Apple wasn't so certain that it could satisfy the court by loading iOS 12.1.1 on the models named by the court, especially after Qualcomm said it would ask the court to expand the ban to the 2018 iPhones. According to MacRumors, the company might have rushed out iOS 12.1.2 on Monday in order to continue selling the banned models in China. While the changelist in the U.S. only mentioned a bug fix for eSIM activation on the 2018 iPhone models, and a bug fix for issues that prevented those in Turkey from achieving a cellular connection on their 2018 iPhones, the changelist in China had two additional listings. One said that iOS 12.1.2 introduces a new animation when force closing apps. 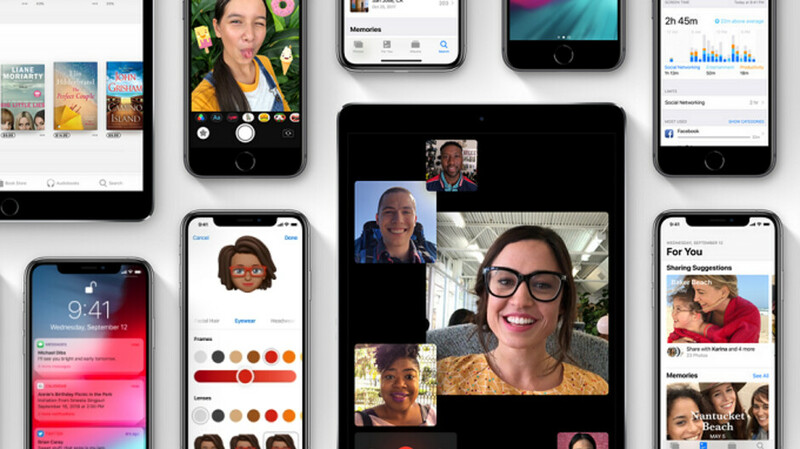 The Qualcomm patents that China's Fuzhou Intermediate People’s Court ruled Apple had infringed on, deal with software that resizes photos and helps those with a touchscreen device manage their applications. As mentioned on the iOS 12.1.2 changelist in China, there is new animation when one force closes an open app on an iPhone in that country. Instead of moving off the screen when the user swipes up, open apps now shrink and disappear when swiped closed. Qualcomm seems to feel that this change was not enough to allow Apple to continue to sell the affected iPhone models in China. That battle will continue. As for the all of the changes that Apple had planned to include with iOS 12.1.2, these will probably end up in iOS 12.1.3. How was apple able to update those phones that were sealed in the box and sitting on shelves? They’re not. They get updated the moment you initially turn it on. When you first start to set up your device it prompts the update. Which means apple is still selling devices that violate the ban. They should have to pay up. My point exactly - unless Apple recalled all those devices and reshipped them back with the update in place? We all know that likely didn't happen though. Am sure as long as a fix is available the court has to allow sale due to letting end user have time to get it. Even if they dont download it. The update is out and if it is enough to satisfy the court then the ban will be lifted. Apple only had to show they have internally made the needed changes. Exactly Doesn't mater if a update is waiting, it's shopping with the QC software. Huh. How are they violating the ban if the consumer won't be able to use the software in question at all?? Apple will violate only if the consumers are able to use QC's software. Oh really? I was under the assumption that it is up to the consumer to start the update process on iOS....didn't know apple was forcing OS upgrades now. When I bought my LG V30 there was an update already waiting...and it's still sitting there because I don't feel like updating. By releasing an update for all iOS devices - Apple has done the due diligence required (from what I see). Whether all devices get updated is not in anyone’s control but the owner of the device. Now there are prevailing “damages” to already used software in past that Apple might still be in hook for. But banning new phone sales which will get updated the moment you initially turn it on, or future devices that already have updated saftware isn’t countering the problem. Qualcomm’s problem is apparently with current devices in use - not future devices. I love how qualcomm is making Apple run around like a headless chicken. This is almost comical. Apple's PR team is phenomenal in that every news agency focuses on how Apple gets around the sales ban and no one focuses on the fact that Apple was yet again found guilty of stealing another company's intellectual property. Please post the evidence and court decision. You were surprisingly not absent from a chance to trash Apple. First, China is the king of patent infringement so a Chinese kangaroo court was all Qualcomm could rely on. Second, patent infringement isn’t even considered stealing, assuming Apple did do it, which they did not. That’s why not only were iPhones not banned anywhere else, but effectively they were not banned in China, since a simple software update solved this desperate attempt by Qualcomm. Sorry your bubble got burst, go smoke some 420 to make yourself feel better. Apple steals but thankfully they are now apparently safe to do business with Communists once again. Ehh. The point is, Apple did get around the sales ban! Obviously every news agency will highlight that rather than make some haters feel good about themselves. The fact that the only country to ban these devices is China speaks for itself. I mean this is a country that had people getting IP out of leaked renders by analysts and then going to court to make money. I don't support Apple when they steal IP from someone else and they may be asked by China to pay QC some money if damages are proven. But if their (QC) claim is software related and Apple has already fixed it then you cannot "BAN" them anymore. All they can do is claim damages. Exactly what I was trying to say above. Because the fans dont care if Apple steals, because they are hypocrites Let this had been Samsung though or Google.